Mother’s day is right around the corner and being a mother myself and celebrating my mother I wanted to go with an easier dessert. 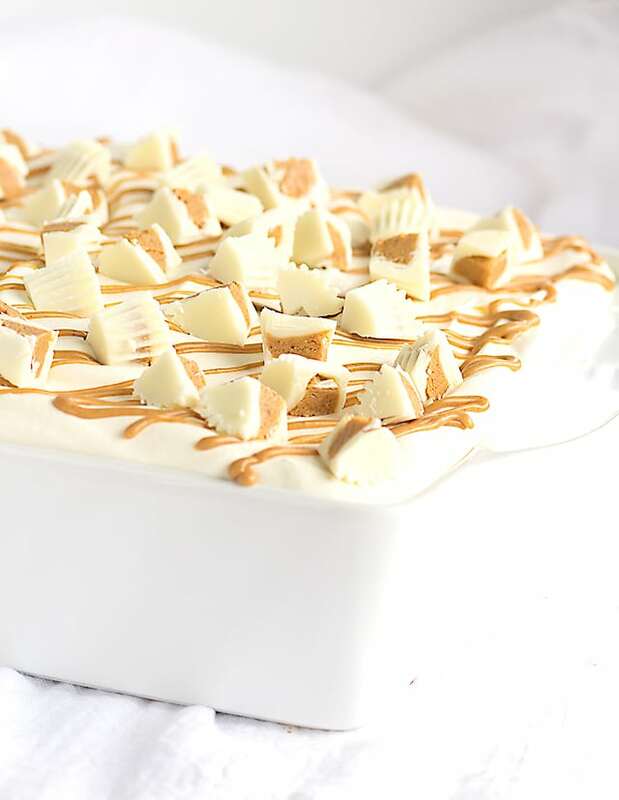 That’s where this no bake white chocolate peanut butter dessert comes in. Are you wondering how it’s no bake, but has a delicious butter pound cake in it? Sara Lee. You can find it in the freezer aisle at your local Walmart along with the Cool Whip! So, you’re probably checking out the layers and wondering what’s inside this baby. 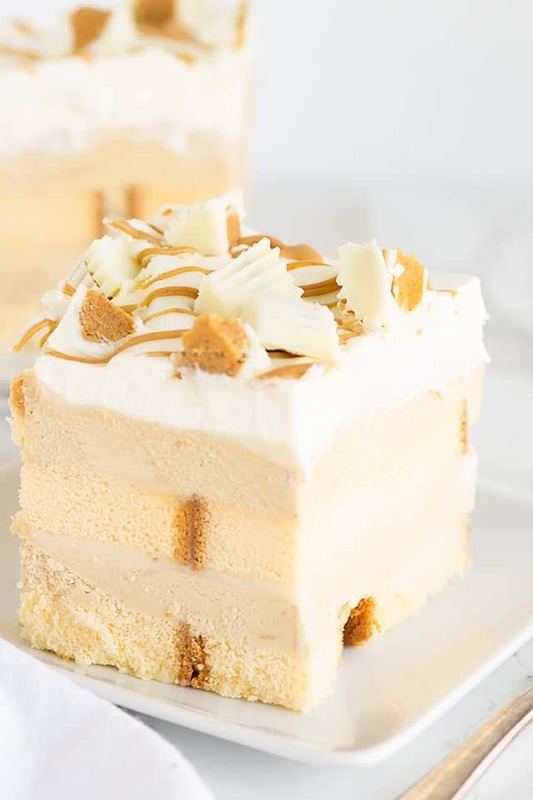 Well, we have some peanut butter mousse, white chocolate ganache, frozen butter pound cake, white chocolate whipped cream, peanut butter drizzle and last but definitely not least white chocolate peanut butter cups. Sounds decadent, right? It is. But we’re making this for mom for Mother’s day. We want it to be an amazing sweet treat. The dessert she’ll brag to her friends about. This is it. This is what you need to step up your game! I feel like this recipe is simple enough that a novice baker dad and/or child could put it together for a mom. It has some pretty neat shortcuts too. I used the Sara Lee pound cake and Cool Whip to make life easier. After all, Sara Lee and Cool Whip are trusted brands that offer a delicious and simple way to make Mom feel special. In a small bowl, add in the white chocolate chips and heavy cream. Microwave for 1 minute and stir. Microwave for an additional minute and stir until smooth. It will take some elbow grease to get it combined and smooth. Once combined, cover with plastic wrap and let chill until thick. It took about 3 hours for mine to thicken. In a large mixing bowl, add in the cream cheese. Mix with a hand mixer until creamy. Add in the peanut butter, margarine, sugar and extract and mix until combined. Scrape down the sides and bottom of the bowl. Give it another quick mix to incorporate anything that isn't thoroughly mixed in. Add in half of the Cool Whip and mix until combined. This will lighten up the mixture for the next addition of Cool Whip. Add in the remaining Cool Whip and mix until all is incorporated. It will be a light and fluffy texture. In an 9x9 square pan, Lay down 8 slices of pound cake. I placed them 2 wide and 4 long. 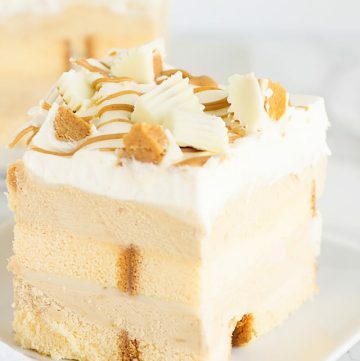 Add half of the peanut butter mousse and spread it over the pound cake. Reserve 1/4 cup of white chocolate ganache for the Cool Whip topping. Spoon half of the white chocolate ganache that's left. Spread it carefully onto the mousse and make sure you get to the edges. Add another 8 slices of pound cake on top of the ganache. I laid the slices down in the opposite direction as I did the first time. Push the slices down slightly into the ganache and mousse. Add the remaining peanut butter mousse and spread out. Make sure it goes to all edges. Pour the remaining white chocolate ganache and spread out. Cover with plastic wrap and place into the fridge. Let it set up overnight so it stays together for nice slices. In a mixing bowl, add in the Cool Whip and reserved white chocolate ganache. Fold in until the ganache is incorporated. Spread on top of the chilled dessert and smooth out. Head the 2 tablespoons of peanut butter in the microwave for 30 seconds. Stir to make sure the peanut butter is fluid. If there are still lumps, microwave another 15 seconds and stir. Add the peanut butter into a sandwich bag. Let it cool slightly so when you pour it, it holds its shape. I would say give it about 2 minutes. Cut a tiny hole into the corner of a sandwich bag. Drizzle the peanut butter back and forth on top of the Cool Whip. 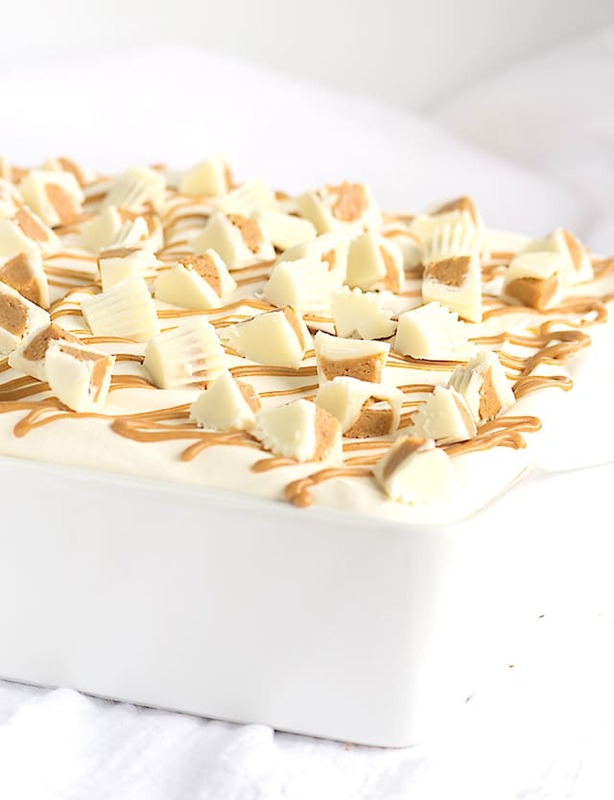 Add the white chocolate peanut butter cups to the top of the dessert. Cut and serve. 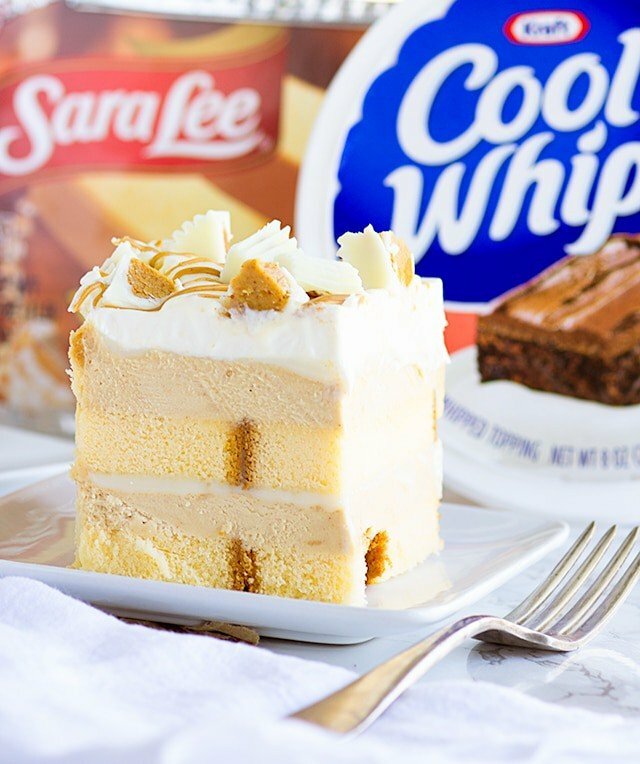 Keeping a Sara Lee dessert and Cool Whip Whipped Topping in your freezer is the perfect way to be prepared for easy entertaining or snacking at any time. Look at me, I was able to throw together a show stopping dessert for myself and my mama no time. Oh my!! So easy and so tasty! Well done! 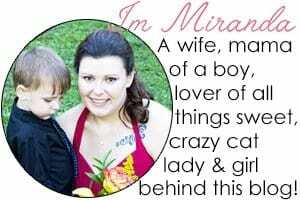 This looks absolutely AMAZING Miranda! Not only does it have all of my favorite flavors, it’s gorgeous too! Thank you! I’ll try to make it over, thanks for the invite! Whoa! This looks amazing! Thanks for linking up with What’s Cookin’ Wednesday! This is gorgeous! I would eat the entire thing in one sitting! Thanks for linking up with Delicious Dishes Recipe Party! WOW this looks absolutely amazing! 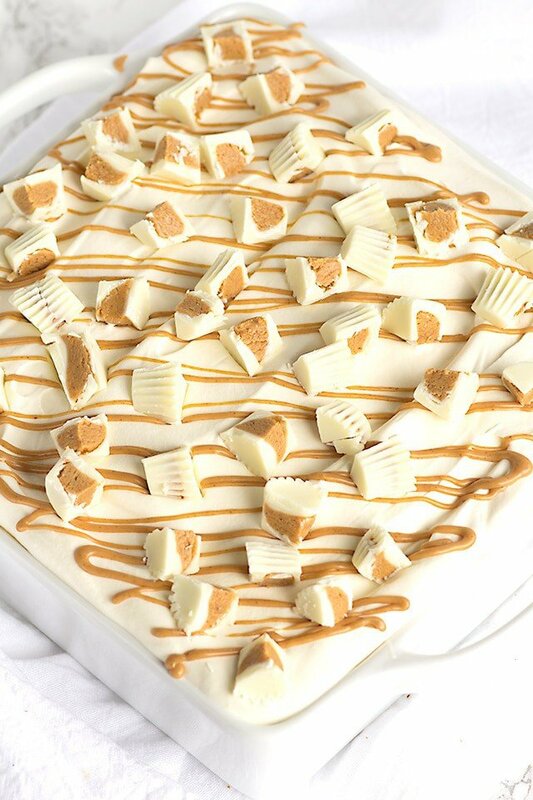 White chocolate and peanut butter is such a great combo!